Watching films, television and reality shows about pregnancy can influence your expectations—and not necessarily for the better. Whether media portrayals of pregnancy and labor are dramatized for laughs or tears, such dramatization may lead to some false assumptions. There are two ways media can promote misconceptions about pregnancy and labor. The first is by creating a scenario in which pregnancy follows a predictable and always enjoyable path. In real life, each pregnancy is unique and some suffer from complications. Not everyone enjoys the much touted pregnancy glow or has a designer maternity wardrobe. Nor is every pregnancy symptom portrayed in comedies is the norm. Pregnancy glow is a good example. While some women’s skin does seem more radiant during pregnancy the surging hormones of pregnancy can also cause skin problems such as acne or itchy rashes. The same goes for cravings, the subject of many comic routines in films and TV. Lucille Ball may have seemed adorable when her pregnant “I Love Lucy” character dipped a pickle in a papaya milkshake, but some expectant moms develop pica, a condition in which they crave non-nutritive substances like laundry starch, cornstarch, and clay dirt. Also, that brief wave of nausea, that so tellingly signals a pregnancy in films, doesn’t happen to everyone and for some women can last for months. It’s easy for women to be misled by media portrayals of pregnancy, but more importantly TV, reality shows and film often over-dramatize childbirth, leading women to view labor as a dangerous procedure in need of medical intervention. Reality shows, in particular, often portray childbirth with a more than average amount of medical intervention. Warning signs of labor as portrayed in films, may also be misleading. For example, most pregnant women on television and film find out they’re in labor when their water breaks, usually in a vary dramatic way, causing a minor flood in an awkward place like the supermarket. It happened to Amy Poehler’s character on a New York City street in “Baby Mama” and to Sofia Vergara’s character at a party in “Modern Family.” In reality only a small percentage of women experience their water breaking at the start of labor. For many it happens during labor. Some women are not even sure if their water has broken, since the amniotic fluid trickles out slowly. Media also often portrays painful contractions starting immediately, when in reality labor, especially for first time mothers, can last for days, starting with mild pre-labor contractions. Labor in media often happens very quickly, prompting emergency situations in unlikely locations such as the back seat of a taxi cab, as it did in an episode of “Frasier.” Babies have been born in taxi cabs, but only 1.5 percent of births happen en route to the desired birthing location. Some women do deliver in a few short hours, but the average length of a woman’s first labor—from first contractions to delivery—is 12 or more hours. Just the pushing stage can take up to two hours. At the beginning of labor, contractions are generally mild and far apart, so doctors advise patients not to go to the hospital until their contractions are 30 to 70 seconds long and are five minutes apart. If you go to the hospital too early in a routine labor, you may wind up being sent home again. So, yes, there is some urgency when labor signals start, but for most families it does not have to result in a high-speed car chase. 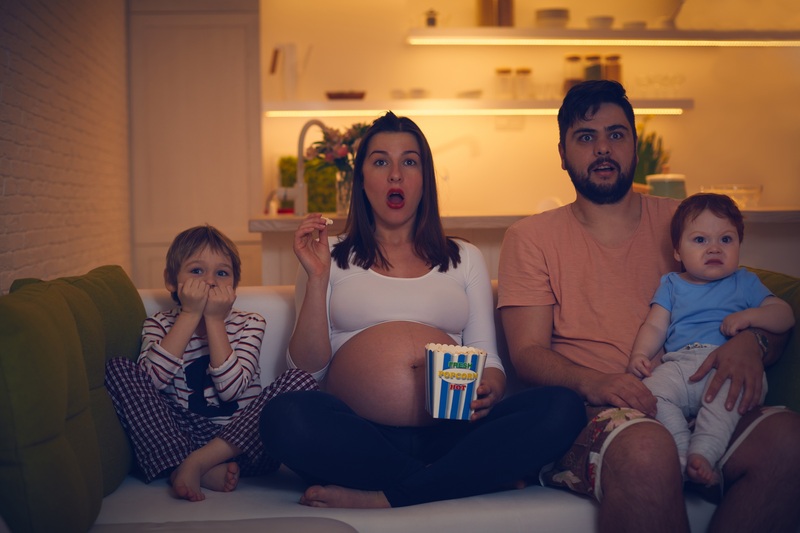 While films and television stories with pregnancy themes may provide enjoyable entertainment, they should not be confused with a source of reliable medical information. Always discuss any pregnancy concerns with your healthcare provider. What Does It Mean if Your Baby Is Sunny Side Up?